Hades, from Bastion developer Supergiant Games, stormed onto the scene with a surprise announcement and release on the Epic Games Store during The Game Awards last December. This rogue-lite game has you playing as Zagreus, son of Hades, who is attempting to escape the Underworld. You find yourself battling onward and upwards through a series of randomized rooms, and receiving boons from several Greek gods (such as Zeus, Poseidon, and Ares) as you make your way towards the surface. If you die, you begin again from the beginning, but you keep many of the resources that you gathered on your previous run. These resources are used to slowly upgrade your character, increasing your chances of success for all subsequent runs! Hades released as an Early Access title, which is Supergiant Game's first attempt at this business model. 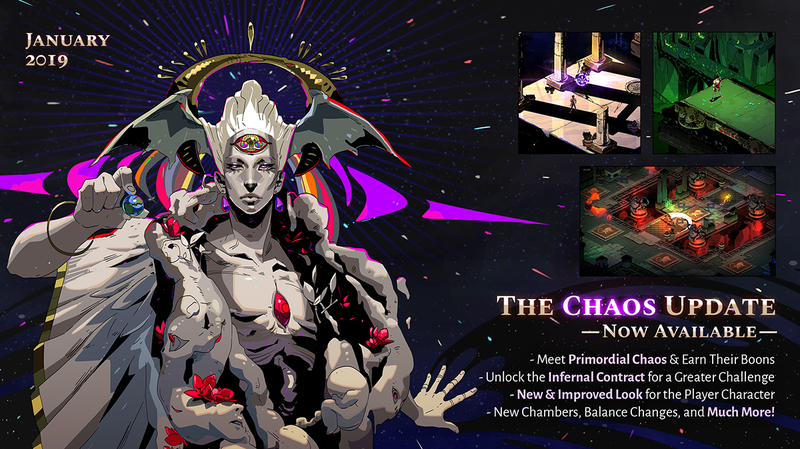 Hades recently received it's first major update titled "The Chaos Update". So what's new? Let's dig in. Instead of giving you a powerful buff and then letting you go on your way, you will instead receive your boon only after dealing with a major setback for several encounters! 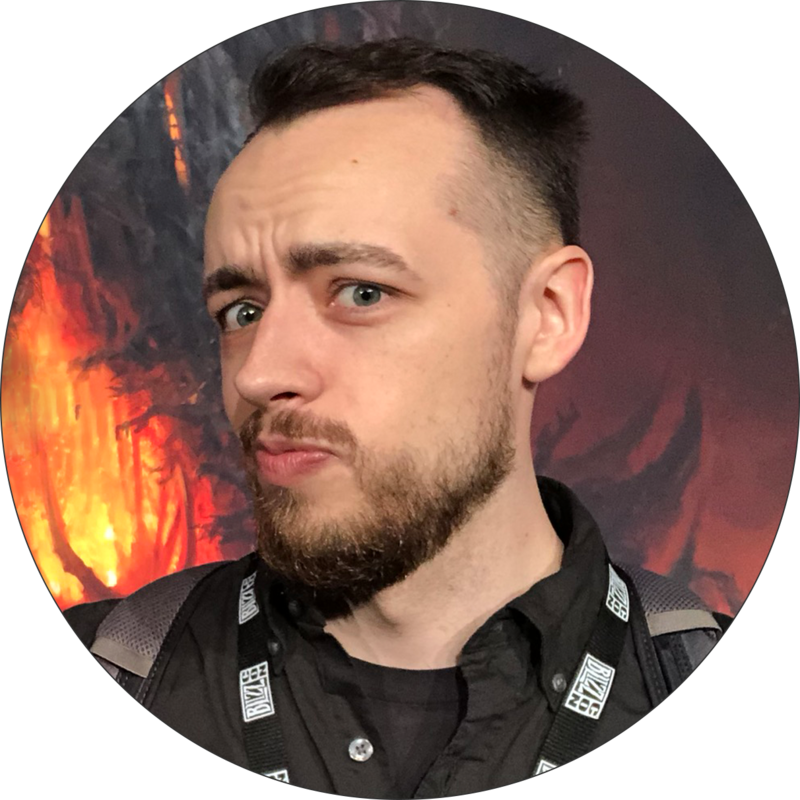 For example, the boon "Caustic Shot" will cause slain foes to toss an Inferno-Bomb at you for the next three encounters; however, you will gain 27 percent increased damage on your Cast afterwards! Another new feature with The Chaos Update is the addition of the "Pact of Punishment". This new feature can be unlocked in Zagreus' room for 10 keys, and will allow you to dynamically increase the games difficulty in ways you see fit. An example of this is the Shared Misery buff, which adds 10 percent more foes to each encounter per rank. These ranks can be purchased with the new "Heat" resource, which can be found during your many attempts to escape the Underworld! The Wretched Broker is a new vendor added to the game which allows you to trade one resource for another. For anyone who does not wish to dynamically increase the difficulty of the game using the new Heat resource, for example, you can instead trade your Heat stockpiles for much more valuable resources, like Darkness. Other resource trading is available, and this new vendor provides a convenient way to invest your time and effort into the game in a more efficient manner. If you're looking for a different kind of challenge during your attempts to escape the Underworld, then the new Perfect Clear Encounter could be just the thing you're looking for! Randomly when entering a new room, Hades will challenge Zagreus to not get hit during the encounter. If you succeed, you will be rewarded for your efforts! There are many other small changes added with The Chaos update, including countless balance changes and tweaks to the games art assets, and all of those changes can be found within the Patch Notes section within the game. Overall, The Chaos Update has proven to be a meaty addition to the game, and has added several new ways to approach your escape attempts! I'm personally looking forward to what the next major update will bring, but The Chaos Update will certainly be keeping me busy until then. For even more on how to survive Hades, check out our wiki!